When we started HOTEL CHARLEROI in 2010, Charleroi gave us the feeling of a town where the time had stopped sometime in the seventies. Coming back every year, we see the city and its perception changing a lot though. In the city centre, the area of Ville Basse is a huge construction site promising new commercial and cultural facilities for a near future. 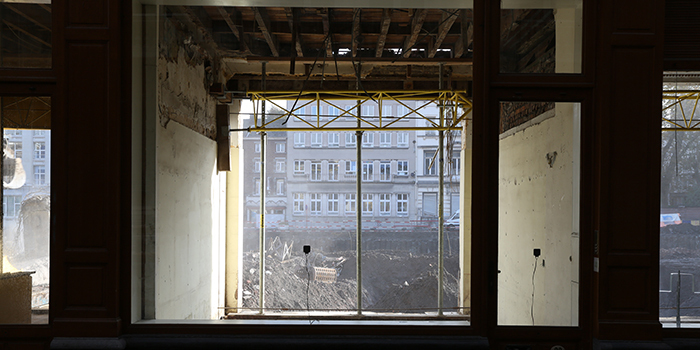 This transition time / space is the best context to situate our project, and we organized HOTEL CHARLEROI 2014 there, in the middle of the rubble, under the rain of November. Rather than an exhibition, LA FORCE DU CHANGEMENT presented itself as a Winter School in public space, with a dense artistic program including performances, discussions, workshops and interventions proposed by about forty contemporary artists and collectives for the people of Charleroi.